Full disclosure: Sam Pugh and I have been friends since we were five. In that time, I have been lucky enough to collaborate with him on everything from videos of action figures to stage plays to pillow forts to video games to high school yearbooks to comic books to short films to bachelor parties to scholarly essays — all to varying degrees of success based on how you define that word. I count them all as huge successes because each of them allowed me to get to know Sam better and learn from him. The thing that has always amazed and inspired me about Sam is how enterprising he is. He always has some project or other cooking in addition to his regular job, where he has serious and important responsibilities, and his being a tremendous family man and all around great guy. The Dinosaur Territory series of books for young readers is his newest endeavor and it is a perfect outlet for his talents for imaginative fiction, historical fact finding, and persuasive world building. You can buy the first book, Dinosaurs of the Unwinnable West, here and learn more about the series at DinosaurTerritory.com. You’ll want to be able to say that you were in on this thing at the ground floor. I am reposting my short review from Amazon below — if you really want to help the Dinosaur Territory cause, buy the book at Amazon, read it, and then leave your own review. Well, everyone knows that there were no dinosaurs roaming the desert back in the Wild West. What this book presupposes is… Maybe there were? 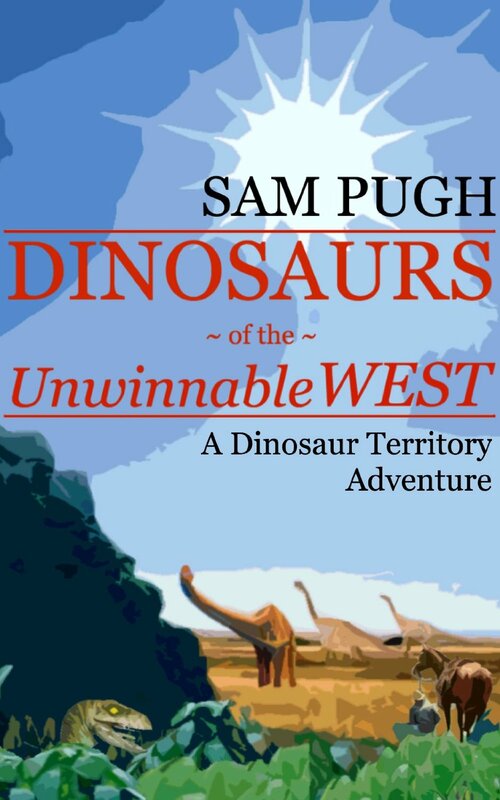 Dinosaurs of the Unwinnable West by Sam Pugh is a rollicking adventure through a lushly imagined world, that will offer young readers a solid primer on dinosaurs, American history, and the Wild West. That it playfully mixes dinosaurs in with western genre elements is the story’s core concept; that it does so without once dumbing down the the scientific info about the different types of dinosaurs or the details about its own re-imagined history of the 19th century is its greatest strength. With his snappy prose, quick-read chapters, and clear characterization of his main characters, author Sam Pugh ably leads readers into the world of Dinosaur Territory — a world I can’t wait to visit again when the next book in the series drops. So saddle up, swear yourself a cuss, and don’t stop reading till you see the whites of their scaly little eyes.